"In Reptilica Barbara Agreste's Symbols" review by Claudia Quintieri..
Barbara liked to scratch on the 35mm film reel creating fluid movements with lines and colour patterns, she then overlapped those two-dimensional animations to photo realistic shots, and used the “stop-motion” technique to animate found objects and children’s’ toys so to create fantastic and surreal pieces. Because of her habit to scratch on film and to squash found photographs from fashion magazines on canvas, Barbara’s early works, both animations and paintings, developed as abstract. We wanted to go deeper into discovering her films, and we found interesting suggestions. 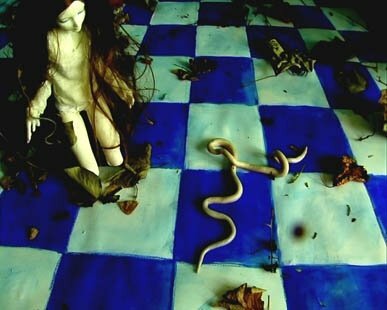 Reptilica is one of her most recent, and it showcases a doll at the centre of a not too steady perspective of chequered walls… A key figure here is the woman: the artist analysing the self, transposed her own mothering experience into an imaginary world full of symbols, very similar to those found in her other videos. The woman’s body is here in close relation to Nature, because it is directly connected to the earth, and to blood, exceeding the too rational squarely divided ground, bending it as it casts its shadow over it. There are many snakes and worms in this gloomy place that, like umbilical cords as flourishing extensions of the woman’s body, remind us of those creatures living on the terrifying head of the Medusa, the mythological figure that would petrify men through her eyes, telling us much about the deadly power of women. But the doll is also sadly a symbol for a perfect lifeless beauty, and with it we can be seduced into identifying with an impeccable idealized image of our own bodies, but this inevitably detaches us from our real self and from our liveliness, bringing along the concept of death. The chessboard, also used in her previous project “The Tower Trilogy”, refers to Lacan’s symbolic world: when we are born we move away from an imaginary world of union with the mother’s body and with Nature, and we begin to see ourselves as separated individuals, so the squared tiles symbolize our rationality that prevails on the instincts, and as we get older our separation can gradually, in some situations, lead to death. The last video by Barbara Agreste, Cyanide, is certainly a rush into an obscure void: the artist sets up a situation in which the viewer is walking through an impervious path, and strange warning objects continuously appear on it. The camera at some point frames two frenetically dancing feet, with red shoes on, that suggest the unrecoverable “loss of control” of the subject, the loss of the survival instinct triggered by fear: the viewer is in a situation of constant danger and yet she keeps running into the unknown. The main character here is always the woman who loses herself completely. Throughout all of Barbara’s works there is this feeling that a game between life and death is taking place, if you win you’ll be OK but if you make the wrong move you’ll die: behind the fake fantastic world of cards and checkers there is a lot of suffering. In “Rain” this agony is even more evident: blood falls from the sky endlessly, there is no hope of escape from the environmental disasters such as pollution, war and death.